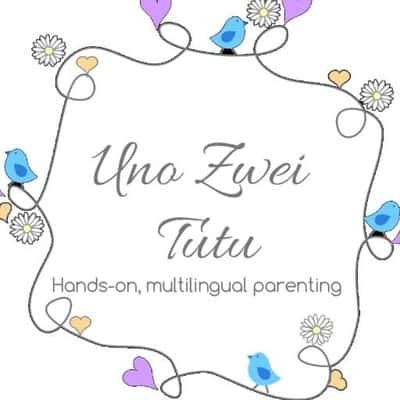 My daughter loves rainbows and ever since we saw a real rainbow last year she has been asking for more.To make her happy I have been including some rainbow activities on our homeschooling schedule every now and then. We have made sensory bins with gelatine (in rainbow colors) and we have painted rainbows on the window with some homemade paint. With St. Patricks day coming I decided it was the perfect time to make some rainbow themed printables. We have also loved playing with some of our favorite rainbow themed toys. 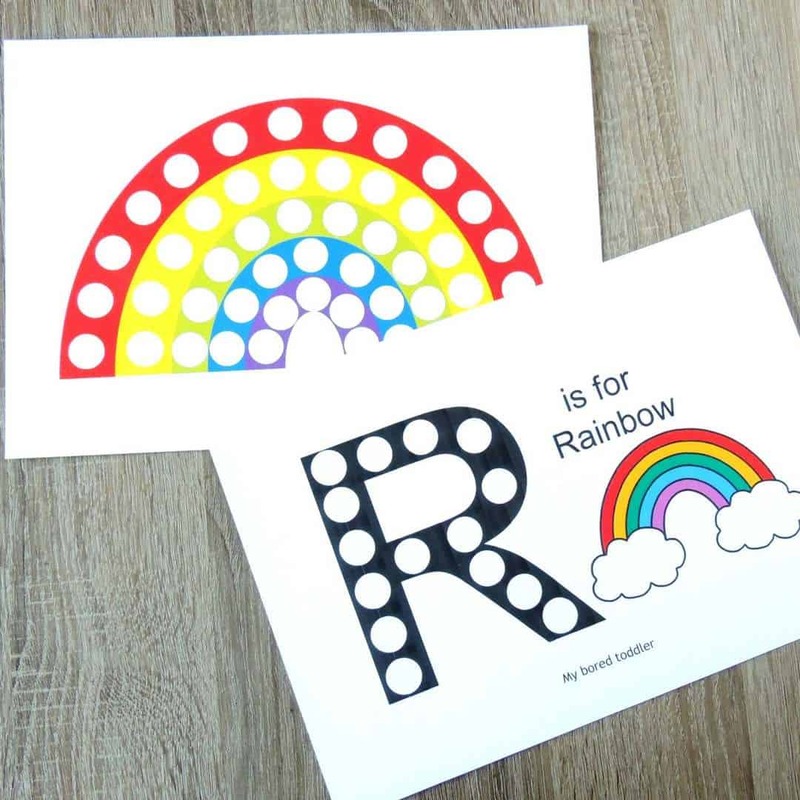 These free printables include a color matching rainbow and a letter R is for rainbow. 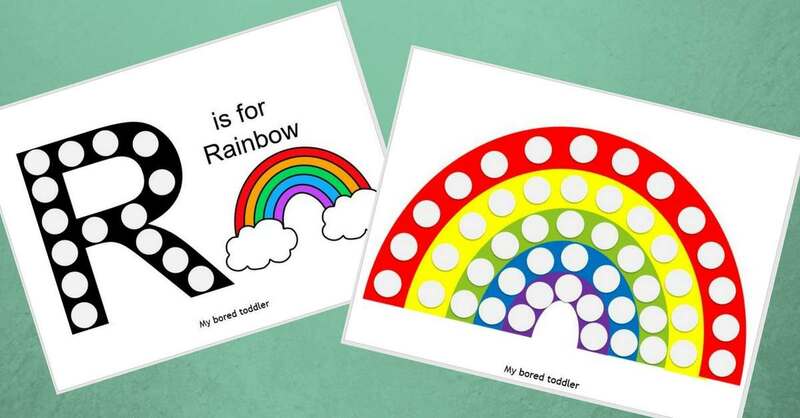 They are a fun way to practice color recognition, color matching and to start introducing letter sounds to toddlers. Laminator (optional) – I really love this hot pink one! 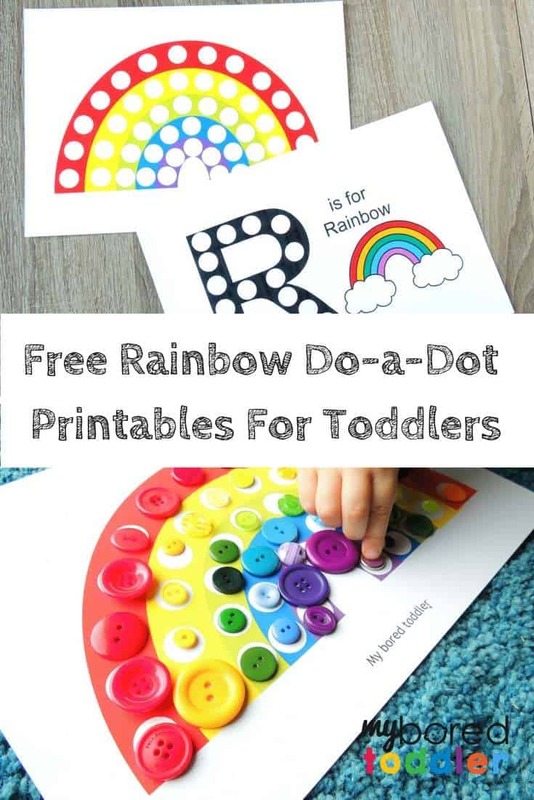 The best thing about these printables is that your toddler can paint them with do-a-dot markers or you can laminate them and re-use them several times. 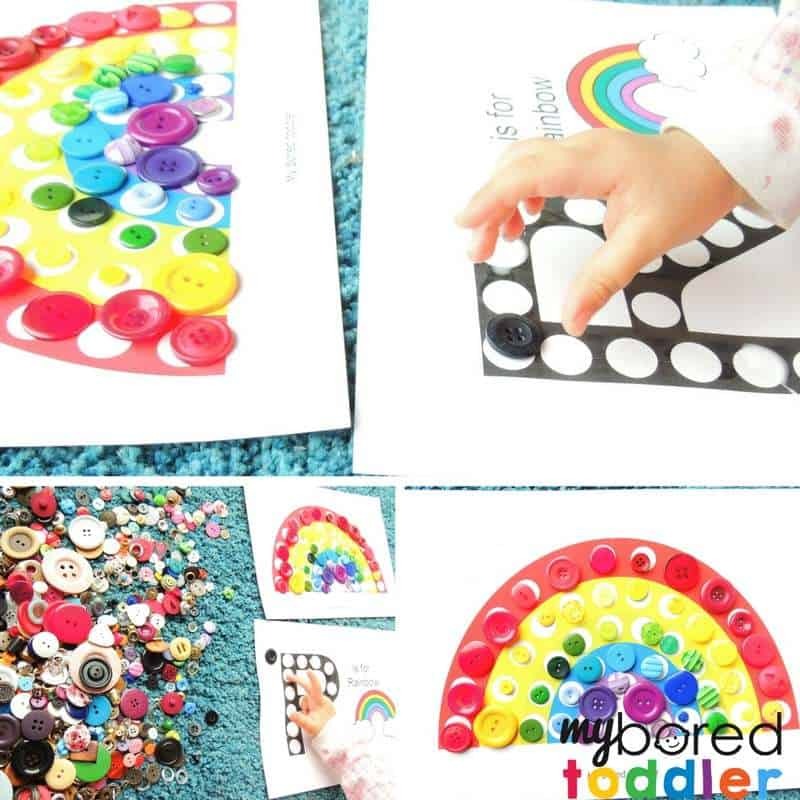 Some fun materials to your toddler can use to fill the dots if you laminate the printables are: playdough, stickers, or pompoms. If you prefer to re-use the printable several times (like I do) then I recommend to laminate it. 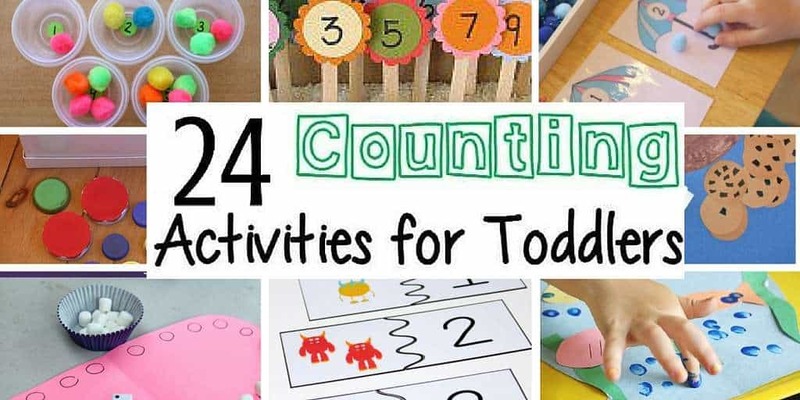 Invite your toddler to play. I had planned to use stickers to fill the dots but when my daughter saw the printable she asked for buttons to fill the dots. It was her own idea and I loved it so I ran to our supply box to find some buttons. She had a lot of fun matching colors and she has asked to work with this printable a few times already! I didn’t laminate the letter R is from Rainbow printable and she glued the buttons. It turned out to be a great way to practice fine motor skills. As she was filling the dots we talked about the letter R and the sound it makes. Maybe next time when she sees it she will recognize it! 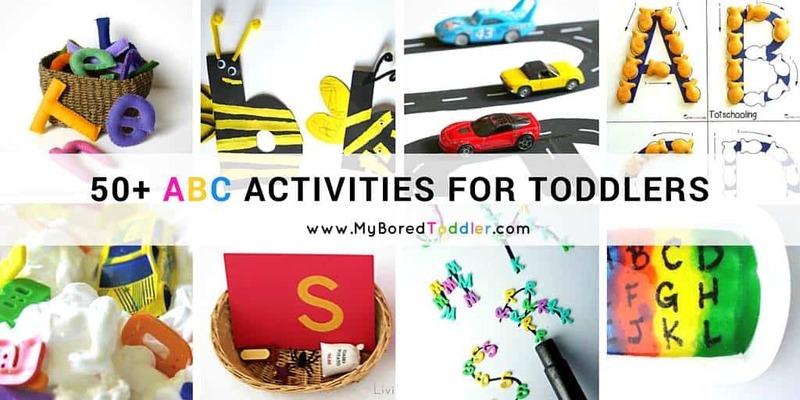 You can find more ABC Activities for toddlers here.